Sawsan Ali Abu Hammad is rarely found sitting behind her desk. 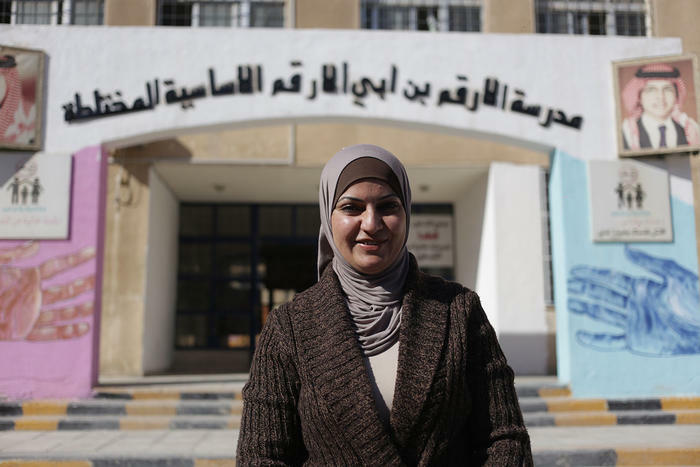 She is the school principal at Al Arqam Elementary School and with 1045 Jordanian and 970 Syrian refugee students there is always something or someone that needs her attention. “This time is crazy,” Sawsan says, smiling as the school bell rings. A bewildered but joyful laugh escapes her, she knows full well the chaos that is about to commence. It’s 12:30pm or “change over time” which means for the Jordanian students it is the end of their schooling day. But for the Syrian students their day is only just about to begin. A school that holds two teaching sessions like this is called a ‘Double Shift’ School. Double shift schools have existed in Jordan for many years, however following the exponential influx of Syrian refugees in the local communities as a result of the Syrian crisis, the Jordanian Ministry of Education decided to specifically establish Jordanian/Syrian double shift schools. Secretary General for Educational Affairs, Mohammad Okour says, "when the situation got worse in Syria and we started getting school aged children refugees in the country we decided to get them back into education system and allowed them to enroll into Jordanian schools." Before the Jordanian/Syrian double shift school was introduced Mohammad Okour says, “numbers inside classrooms reached 70 and 75 students per class." As per its name, the double shift schools are designed to allow two shifts of teaching, an early session, 7am - 12:30pm is held of the local Jordanian students while a later shift from 1pm - 4:30pm is held for the Syrian students. The decision to commence double shift schools was "publicly announced in the newspapers by the minister and then rolled out," says Rana Kawar, an Education specialist from UNICEF. UNICEF have been particularly involved with the establishment of these schools, helping to source teachers, raise funding and roll out support across the schools. "With the right funding and teacher supply it doesn’t take more than two weeks to open a double shift school.” says Rana. Sawsan admits there have been some challenges. “The violence challenge is the biggest one,” she says. “It was between Jordanian and Syrian students themselves not accepting each other and maybe something with the community around us because they don’t want the quality of the education to be affected by the second shift, especially from the Jordanian side. Four years since becoming a shift school and Sawsan says “things are getting better.” There are now a number of programs to support school cohesion between Syrian and Jordanian students and the students are getting along. While there’s still a long way to go, each and every one of these double shift schools provides a little more hope of a formal education for the Syrian refugees.